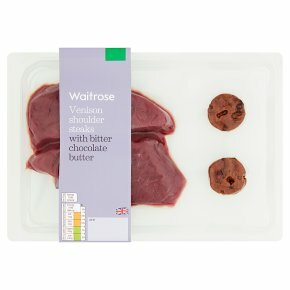 INGREDIENTS: British venison (92%), unsalted butter (milk), cocoa mass, sugar, cocoa powder, diced shallots, white wine vinegar, smoked sea salt, white wine, cracked black pepper, cocoa butter, soya lecithin. PAN FRY. Rare 6-8 mins. Medium 8-10 mins. Well Done 12-14 mins. Heat 1 tbsp of oil in frying pan. Add steak and cook on a high heat to seal. Turn and seal other side. Reduce to medium heat. Add butter to pan in the last minute of cooking. Due to the natural variability in the thickness of the meat, the cooking instructions provided are a base guide. For thicker steaks, additional cooking time may be required. Ensure surface of the meat is thoroughly cooked. Once cooked, cover with foil and allow to rest for 10 minutes. Carve then spoon over melted bitter chocolate butter.